"Quiverfull is a small group, probably 10,000 fast-growing families, mainly in the Midwest and South. But they have large ambitions, says Kathryn Joyce, who has written about the movement in her book Quiverfull: Inside The Christian Patriarchy Movement." "[E]xhaustively researched and fascinating new book . . . Quite refreshing . . . Joyce is breaking truly new ground here." "This movement, with strong ties to the homeschool movement and to Christian Reconstructionism, takes a spectrum of extreme positions on patriarchal authority within the family and the subjugation of women in society. We talk about their opposition to contraception and touch on the influence this thought wields within the Southern Baptist Convention." "[An] excellent, frightening new book . . . Quiverfull merits wide readership." 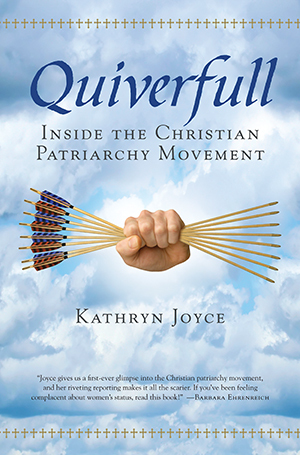 "In her book Quiverfull: Inside the Christian Patriarchy Movement, journalist Kathryn Joyce approaches Quiverfull followers with deep curiosity and the restraint of a good journalist . . . A very insightful book into what is, I think, a very important movement to watch on the religious right." "[E]ngrossing . . . Skillfully reported by journalist Kathryn Joyce, Quiverfull has echoes of The Handmaid’s Tale. Unfortunately, it’s not fiction." "Journalist Joyce has conducted a groundbreaking investigation of a little-known movement among Christian evangelicals . . . future historians and journalists will owe Joyce a debt of gratitude for her foray into this still nascent religious group." "Joyce's keen reporting . . . will prove to be an invaluable resource for understanding the origins of some of [Rick Warren's] comments on gender."